Gift certificates are available for any amount of $100 or more and may be purchased on our website. You may select from one of the preset amounts below. If you would like to purchase another amount, please contact us and we can take your order over the phone. We accept PayPal or major credit cards and can mail a gift certificate to a recipient. A $10.00 shipping and handling fee will apply. 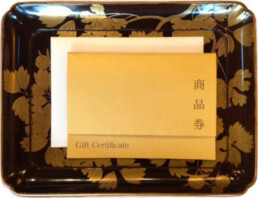 You will have an option to include a personalized message if we mail a gift certificate directly to a recipient.